Overpopulation on Earth and a severe lack of resources led to a global crisis without precedents in the history of mankind. New technologies have allowed numerous advances and have provided us with different ways of exploiting natural resources for generations. But we seemed to forget that everything has a price, and always something has to give... After it all became critical, the remaining nations of the world created the Global Governments Alliance, which pushed forward a Space Colonization Project, being the S.T.A.R. 1088 Harvester Spaceship a part of it. However, its fate becomes compromised when something crashes against the hull causing a global system failure, rendering the whole spaceship inoperational and out of control, leaving everybody stranded under a complete lockdown. Prepare for an unforgiving journey across 'the mother of all ships' while struggling against the odds to send a signal in hopes help arrives. I would like to focus on the mod itself a bit deeper, interfaces, gameplay, science fiction. Before we get started I would like to briefly talk about the media (images or videos) that gets uploaded to this profile. Someone asked me if those were "final" screenshots. It is important for you to know that everything you see is very early footage from how the build process is going. Even though the screenshots may look very close to what the final product will look like when completed, I always try to improve EVERYTHING and polish it to a point where it no longer requires further improvements. There's always room for polishing but as I'm alone I have to speed up this process and at some point leave an area to start polishing the next. And so the process continues. And again, I'll never get tired of saying this, your comments DO help! Today I would like to focus on the mod itself a bit deeper, interfaces, gameplay, science fiction. 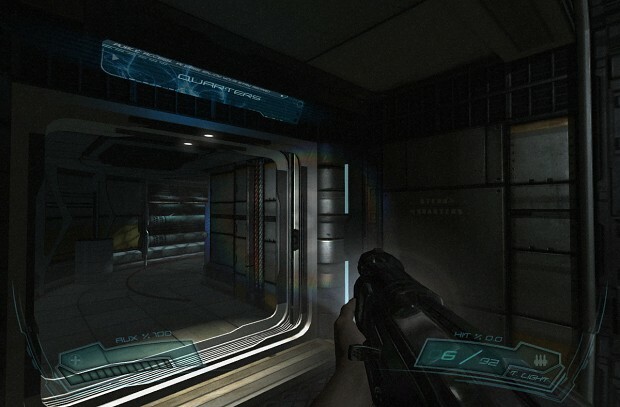 There are no Doom 3 interfaces here. I'm going for something a bit more difficult as every interface is composed of different elements overlapping each other, creating a 3D look. Joking aside, I'm not using them anymore, Instead I'm re-doing all GUIs from scratch fitting to THIS project. Every interface has a purpose. Many of them are "activators" and should be interacted with by standing in front of them at a close distance. 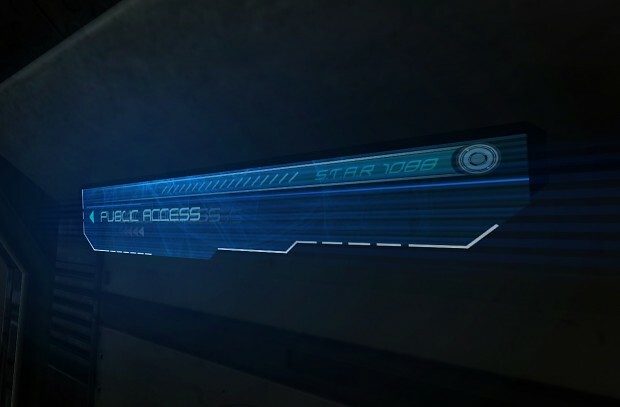 The GUI processes the order and activates its door. So apart from being activators, there are also different types such as "indicators". These are usually non-interactive and their purpose is mainly to provide information about the physical surroundings. And there's another type of UI which I'd dare call "complex GUIs". These do not "indicate" anything but they don't "activate" any other thing either. Their only purpose is to provide complex information. 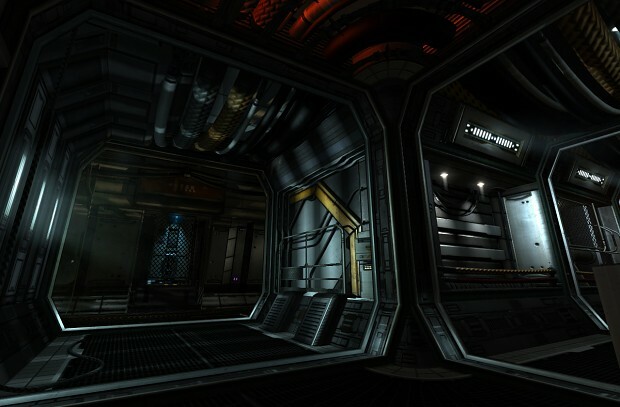 Whether it's a text log or a message station, these interfaces will acquaint you with the story of the ship, and not that much with your physical surroundings. As for gameplay and the campaign, I'm going for a horror campaign with exclusive locations, detailed environments, fresh sounds, tough enemies, puzzles and exploration. I hope I'm not failing at all this. I have changed my mind in regards with how the shotgun and its attached flashlight behave. Apart from what I explained above with the interfaces, I'm actually not the kind of person who likes to explain everything "pre-release", I usually like people to discover what's in there and how the world around them works when they have the product running on their own rigs. It also contributes to the "surprise factor". Until yesterday the tactical light was available only when we aimed the weapon. It would not be possible to "use" or "turn on" the flashlight when the gun was idling (or in idle state for that matter). But some people asked why would we need to aim to actually have the flashlight turned on? Well, that question kept me thinking to be honest. My goal was to balance things out, since you would not be allowed to run when aiming with a gun (whichever gun it is) and this would somehow encourage exploration too. But the main point was because this is meant to be a very slow paced campaign, so being able to both run & light the place up just didn't feel right for the type of mod I want. So to avoid having to aim to actually get to the light, I made things a bit easier for us all. You can toggle your light whenever you want, there's a button for that, but when running any weapon you're holding will be holstered, giving a small speed reward yet preventing us from shooting or using any other attachment. Again, the shotgun is the only weapon with this capability. This mod somehow represents the classic sci-fi scenario: Far future, a spaceship, horror, bits of action. Yet I thought I could turn this more to the cinematic, more-close-to-realism side. So the first thing one is going to think of is gravity. How is gravity provided aboard a spaceship? How is it provided aboard THIS spaceship in particular? Well, I really don't want to say much, but there is going to be something generating weight aboard. There's also something that cannot go unnoticed. If we happened to go to space without proper suits, and imaginining we would not die for the lack of oxygen and our body collapsing, we would still die by the massive ammount of radiation. So, how is the ship being protected against it? Well, then again I'm afraid I'll have to let all of you try it yourself and figure it out while playing. Nothing will remain unexplained in the end, but nothing is going to be explained DIRECTLY to you. Last but not least, I would like to thank Kyle_K_ski, a member from this site, who has given me very valuable advice for the project, such as the way gravity is "generated" aboard, amongst many other precious ideas worthy of a very good writer. I hope you like what you see, give me some feedback if you have a few seconds, and as always spread the word! Very nice! Lovin the guis! Good to see progress :) Your game sound very interesting, also new screen shoots show a lot of good work, they are very polished. "You can toggle your light whenever you want, there's a button for that, but when running any weapon you're holding will be holstered, giving a small speed reward yet preventing us from shooting or using any other attachment. Again, the shotgun is the only weapon with this capability." yes that makes more sense to me, balance vs realism. Best to get something in between.